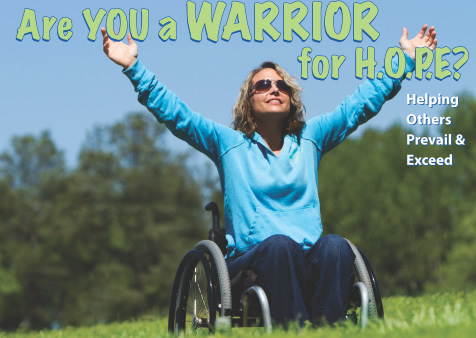 What makes you a Warrior For H.O.P.E.? Well, what is a Warrior? warrior [wawr-yer] noun: A person who has courage, perseverance, leadership and strength. Anyone who has been affected by Spina Bifida knows the struggles of this birth defect. But, if you have Spina Bifida or know someone who has been affected by this birth defect, then you know what it takes to have strength, courage, leadership, and perserverance and that makes YOU a WARRIOR! Warriors for H.O.P.E. is a program of the Spina Bifida Association of GA (SBAG) that aims to spread awareness about Spina Bifida (SB), HOPE and inspiration to those affected by this birth defect. Our goal is to be a ray of sunshine for those with Spina Bifida. Even though Spina Bifida has three main categories that a diagnosis usually falls within, everyone’s SB experience is different. This makes us unified in the birth defect but still unique in our experiences. Often SB is only shown in the light of science or negativity. We provide an outreach of “Warrior” Stories to show the positive sides of this birth defect, and how each experience is different, but the outlook can be positive no matter what. In doing this it is our HOPE that we can not only spread SB awareness, but also spread inspiration, comfort, and care to others. Then everyone affected by this birth defect either personally or through someone they know with SB can see that we are ALL Warriors For H.O.P.E. (Helping Others Prevail & Exceed)!